Our older daughter is usually flattered by the attention our youngest is constantly giving her. We all know, that can wear off. Our daughter, a great big sister, also needs her space. It is hard being an older sibling. All the compassion in the world still makes it hard to be followed around and imitated by a two year old all day. We can help by making things easier for our older children, which in turn will make the situation better for our toddler also. Acknowledge that you understand how your older child feels. Let her know that you're there to listen. Let her air her grievances. In particular, let her know that it is normal for her to feel frustrated and angry and irritated with a younger sibling. Be sure she understands that you are not mad at her because she is frustrated. Use personal stories so that she understands that she was a toddler once also, and that she loved to imitate you, or her older sibling. Using personal stories has been the best way to help our daughter (and son.) One day when our daughter was frustrated I sat down with her and told her how I felt when my younger brother imitated me, and followed me around trying to play all day. I explained to her that "Imitation is the greatest form of flattery" and explained why younger siblings want so much attention from older siblings. It really opened her eyes to the situation and made things easier. Your oldest should be confident that her toys and special things are safe. Be proactive. Help her keep her special things in special places so little hands can't reach them. It is also a good time to teach her to put things away when she is done with them so they can't be broken or ruined. If little hands do get a hold of the "untouchables", don't get mad. They don't know any better. Take a minute to explain that they need to ask permission to play with big sisters toys. If your older child wants to share, great, but if not, remove your younger child and get them involved in something else. Make sure your older child gets some privacy. Some time to themselves. A great time to do this is when your younger child is sleeping. 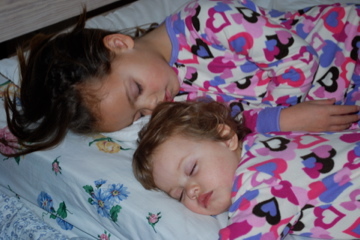 Feeling like they have their own time will make it easier to share and play with the younger sibling when they wake up. Your oldest will resent you if you are expecting her to always entertain her younger sibling. Or, if you expect her to include her younger sibling while playing with her friends. If she wants to include her, or watch her, great, but don't put pressure on her and expect it. I find myself guilty of this. I have said more times than I can count, "Can you just play with your sister while I take care of this." We have to be careful. We should not pressure our older siblings into "giving in" to their younger siblings. They are not in charge of keeping the peace and giving up their rights just because they are the oldest. If we put this pressure on them, they will start to feel punished because they were born first. Put together games and activities that let your older child be in charge. It will make it more fun to play with younger siblings. A favorite in our house is playing school, or church. Our oldest daughter sets up the school room, homework, chalkboard and all. Our younger daughter loves to be the student. It makes her feel big because she is going to school just like her brother and sister. Our oldest daughter feels important because she is the teacher and in charge. Put together opportunities where they feel important because they are older, not punished. Remember that we don't want to micromanage. Set rules and guidelines and let your children work things out themselves also. There will always be arguments and disagreements, that is normal childhood. Just be sure that if it turns to hitting and tears, you step in. Lots of hitting and fighting going on? Check out Can't we all just get along, and Do your kids fight? ...Trick Question for great advice on how to handle it. DOES YOUR OLDEST COMPLAIN ABOUT THEIR YOUNGER SIBLINGS? HOW DO YOU MAKE THINGS EASIER FOR YOUR OLDEST? Thanks, so glad it helped. I am an oldest child also. Funny that even though I know what it is like, I still find myself breaking some of the "rules." I have to be careful, to not place to much responsibility on our oldest.